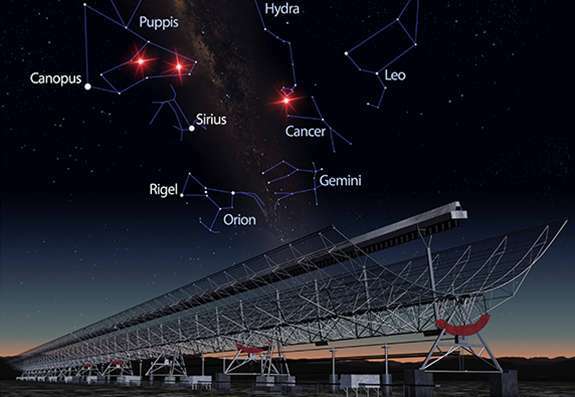 Artist’s impression shows three bright red flashes depicting fast radio bursts far beyond the Milky Way, appearing in the constellations Puppis and Hydra. Credit: James Josephides/Mike Dalley. Fast Radio Bursts present one of modern astronomy's greatest mysteries: what or who in the Universe is transmitting short bursts of radio energy across the cosmos? Manisha Caleb, a PhD candidate at Australian National University, Swinburne University of Technology and the ARC Centre of Excellence for All-sky Astrophysics (CAASTRO), has confirmed that the mystery bursts of radio waves that astronomers have hunted for ten years really do come from outer space. Discovered almost 10 years ago at CSIRO's Parkes radio telescope, Fast Radio Bursts are millisecond-duration intense pulses of radio light that appear to be coming from vast distances. They are about a billion times more luminous than anything we have ever seen in our own Milky Way galaxy. One potential explanation of the mystery is that they weren't really coming from outer space, but were some form of local interference tricking astronomers into searching for new theories of their 'impossible' radio energy. "Perhaps the most bizarre explanation for the FRBs is that they were alien transmissions," says ARC Laureate Fellow Professor Matthew Bailes from Swinburne. "Conventional single dish radio telescopes have difficulty establishing that transmissions originate beyond the Earth's atmosphere," says Swinburne's Dr Chris Flynn. In 2013 CAASTRO scientists and engineers realised that the Molonglo telescope's unique architecture could place a minimum distance to the FRBs due to its enormous focal length. A massive re-engineering effort began, which is now opening a new window on the Universe. The Molonglo telescope has a huge collecting area (18,000 square metres) and a large field of view (eight square degrees on the sky), which makes it excellent for hunting for fast radio bursts. Ms Caleb's project was to develop software to sift through the 1000 TB of data produced each day. Her work paid off with the three new FRB discoveries. "It is very exciting to see the University of Sydney's Molonglo telescope making such important scientific discoveries by partnering with Swinburne's expertise in supercomputing", says Professor Anne Green of the University of Sydney. Thanks to further funding from the Australian Research Council the telescope will be improved even more to gain the ability to localise bursts to an individual galaxy. "Figuring out where the bursts come from is the key to understanding what makes them. Only one burst has been linked to a specific galaxy," Ms Caleb says. "We expect Molonglo will do this for many more bursts." What if these burst were some form of communication by an evil race of aliens hoping to get a reply from their next planet to consume? :P Fishing is after all a very profitable way of gathering resources. Why would some aliens need a reply to move on? Maybe because it's not the planet they want, but intelligent beings. Maybe they use them as some sort of slaves for highly advanced and dangerous work. Maybe they depend on them and since they lose slaves in the process, they need new ones to replenish their intelli-plantations. The work done there is probably dangerous, since it would affect the slaves' reproductive capability (and probably their nervous system too) - just like nuclear radiation would; that's why slaves are not self-replenishing. Now since they use intelligent slaves they must be pretty good at holding them, otherwise we would have already been visited by runaway slaves and warned about the whole business. It's just a hypothesis, bu then we don't hear much form out there, which could mean that there's no one out there, or something is keeping everyone in tight check. In the latter case, we are next. Maybe they use them as some sort of slaves for highly advanced and dangerous work. The slavery angle is ridiculouse. The amount of environmental adjustments you'd need to make a slave species viable for...anything...would be enormous. Bots would be far easier. This is one of those things where earth history has been transplanted into a cosmic setting because it makes for a gripping story in sci-fi movies. But when you think about it for a second it makes absolutely no sense. So if FRB events do arrive from cosmological distances it would be good now to establish a relationship between distance and number of events at that distance. We might be looking at energetic processes that became increasingly rare as the universe aged. Or, we might be looking at events that are simply so rare that a huge sample is required to find any. Most of that huge sample would be found at cosmological distances, hence, the few events we are likely to observe would be very distant. The stats should tell us whether these events are exclusive to the very old universe, or whether they are simply very rare, but still possible in the nearby universe. I thought Michio thought these were some for of gamma ray burster or other type of massive cosmic event? ...It's just a hypothesis, but then we don't hear much form out there, which could mean that there's no one out there, or something is keeping everyone in tight check. if you were to take a serious look at the decades of evidence, then you would conclude that they are already here, hiding mostly on the back side of the moon, and elsewhere. The Zoo model is correct, except that any intelligent race out there will always be wary of a more advanced race. So the only logical situation is that new races are not allowed off planet until they learn to behave. We are not ready, still fighting among ourselves. Alien Ethics are superior to ours! So they are watching, only interfering when we threaten the long-term viability of the planet, such as nuclear war or reactor meltdown. That is why UFO's were seen around Chernobyl (hovered hours) and Fukushima. So since they are here, they must of mastered faster than light travel. So then the relativists physics becomes untenable. You can NOT be serious. That is the most patently absurd thing I have ever seen posted on this site! You are saying that Einstein's theory of relativity must be wrong because you are convinced that aliens are watching us! This amazing leap of "logic" explains how you have come to believe all the other ridiculous nonsense you post on this site, and makes it clear why NOBODY should take you seriously. hiding mostly on the back side of the moon, and elsewhere. Note: we've had probes fly around the Moon quite a bit, you know? No aliens in sight. Go figure. Logic really isn't your strong suite. If anyone needed any more proof - this would be it. So long as we are postulating alien communications, it might be slightly more plausible to imagine that an answer to the signal provides the nefarious aliens with the location of an hospitable world. But when we realize the tremendous energy required to simply make the signal, the entire alien communication abstract falls apart very quickly. If you have that kind of resource at your disposal, you are already in control of sufficient energy to throw a significant portion of a galaxy's share away from time to time. I would imagine this will turn out to be an attribute of a large scale celestial object, like a massive black hole, or some other object that has a similar amount of concentrated energy available. We've seen the back side of the moon. Theyre not there. -Then why arent they hiding on the front side of the moon where they can see us? Good scifi requires good thinking as well you know? Although after seeing 'Passengers' I suppose its not mandatory. Machine cultures would be very good at making peripherals that were far more capable than whatever organics they could scavenge off distant planets. For good scifi watch "The Expanse" . . . I'm reminded of the Kurt Vonnegut story about aliens creating humans to test various viruses on . . . like we use lab rats . . .
Nope! I still think there is too much about the universe we don't know about. Maybe these ARE regular signals but for some reason we don't come within the 'line of sight' too often. Let's wait awhile eh? So long as we are postulating alien communications, it might be slightly more plausible to imagine that an answer to the signal provides the nefarious aliens with the location of an hospitable world. But when we realize the tremendous energy required to simply make the signal, the entire alien communication abstract falls apart very quickly. If you have that kind of resource at your disposal, you are already in control of sufficient energy to throw a significant portion of a galaxy's share away from time to time. His explanation makes sense to a certain degree, but where is it written that this is required? We hunt animals for fun, makes no sense to me though. LOL. You may fool yourselves, but not me. I witnessed the uninterrupted 2nd Apollo 17 EVA in the auditorium at NASA in Houston while the rest of you watched sit-coms on TV. I know better, having studied the matter. Notice how quickly both the spooks and the spooked jumped to quash this idea? The former for national security reasons, the latter due to vested career interests. The reality of our situation is simply too bizarre to consider; down right scary. Aliens know this. No doubt they have established Generally-Accepted-Practices for this situation; ground-rules, having gone through it many times before. After all, the universe if very old, even if you still adhere to the Huge Bang Fantasy. @Tuxford, Oh don't worry you aren't the only one and believe me it isn't aliens I afraid of. Are these radio burst modulated? They would have to carry information in some way, unless its just a way of saying "here I am, lets talk." Even that wouldn't work unless you could reply, "OK, how?" Maybe they work on a different time base. Instead of sending a message in a microsecond, maybe they do it in 1 million years. Maybe someone out there doesn't hurry at all. What we see may be bits on an interstellarnet (that's a cute name, I think I'll quote myself :) ) with a speed on the order of picoHertz.